Completely captivating character drama that I hoped would never end. Somewhere within our crowded sky, a crew of wormhole builders hops from planet to planet, on their way to the job of a lifetime. The galaxy at large, humanity is a minor species, and one patched-up construction vessel is a mere speck on the starchart. This is an everyday sort of ship, just trying to get from here to there. But all voyages leave their mark, and even the most ordinary of people have stories worth telling. A young Martian woman, hoping the vastness of space will put some distance between herself and the life she’s left behind. An alien pilot, navigating life without her own kind. A pacifist captain, awaiting the return of a loved one at war. Add The Long Way to a Small, Angry Planet to your Amazon Wishlist. I had no idea what to expect when I turned to the first page of The Long Way to a Small, Angry Planet. It’s a bit of a departure from my usual reading – I tend to read more YA than adult and only occasionally do those YA novels venture in Sci-Fi territory – but the but the absolutely stunning cover and the intriguing blurb peaked my curiosity so I decided to try something different and pick it up. And I’m so, so glad I did. I completely adored this novel. It’s delightfully unusual and utterly charming. I struggled to put it down, and even when I had to I found myself immediately transported away from Earth and propelled into outer space onboard the Wayfarer. The strange thing about The Long Way to a Small, Angry Planet is that the title literally tells you the entire plot. Nothing much really happens in this book, but it doesn’t matter and you won’t notice. Instead it’s about getting to know the eclectic group of characters travelling on the Wayfarer, their histories, the amazing range of different species they come from and how they interact with one another – you’ll fall in love with every one of them. Then you’ll discover new planets and their communities and their terrain as you travel through the universe and beyond on your journey. It’s incredible how enormous the universe Becky Chambers has created is, and I didn’t want to leave it. I have an endless list of my favourite elements of this story, but among the standouts are Lovelace, the Wayfarer’s AI. I found the way Becky Chambers managed to make Lovelace a believable character in her own right and the way she explored the relationship between the AI and the ship’s crew members was beautifully done and very thought-provoking, too. 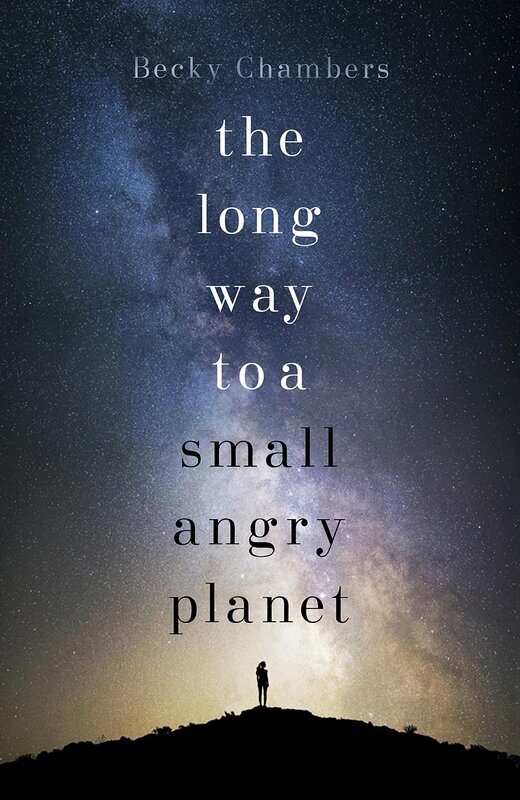 I would recommend The Long Way to a Small, Angry Planet to anyone looking for a new book to read. It’s written in a way that’s readable for everyone – there’s no complicated or confusing science to wrap your head around and the language is easy-to-read and flows effortlessly – and I have no doubt that it’ll captivate those who read it as much as it captivated me and you’ll be keeping your eye out for your next sci-fi novel once it’s over. And for those who are already fans of sci-fi, this one’s a no-brainer.